Lets see, Arkansas has lost 17 straight SEC games and yes they are due, but LSU the best team in the nation with 3 losses and all but the Auburn game they could have won. They are battle tested and road trip to Arkansas is hardly going to set them back. 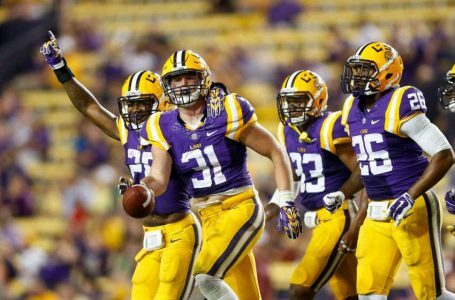 LSU can flat out run the ball along with Arky, but no one has pushed LSU around up from this season and they will hold their own here. Numerous experts say this is Arkansas’s first win, they are lying in wait, and LSU will get out coached here. I am not putting a buy sign on Arkansas because LSU lost a tough game last week. The Tigers had both Alabama and Miss. St. on the ropes and could have won either game. Arkansas has failed on every test their last 17 conference games. LSU can expose their rare passing game and exploit a Hog defense suspect to the pass, and Arky out manned here at home against a pissed off LSU team off a heart breaker against mighty Alabama. The set up looks sweet for the Razorbacks and LSU will in fact be in for another dogfight here but it has been 6 years since LSU lost back to back games, and I expect them to bounce back here against a team who has lost 17 SEC games in a row. Off a 4-0 Sweep last Saturday – I have ALL UNDERDOGS THAT BITE this weekend on a 3 Play Flat Bet Card. Live Dogs Galore – CASH OUT.